Kenyan Athlete: I want to start running; how do I begin? I want to start running; how do I begin? Perhaps being inspired by the great run by Eliud Kipchoge at the Berlin Marathon this weekend, I have been getting numerous calls and text messages from many people who are interested in joining the runners’ club. Well, beginning to run is the best decision one can ever make in their lives. As Kipchoge himself puts it, “no human is limited.” Whatever one sets to achieve in running, they will surely do so with the right “elements.” Beginning it gradually is the best approach. Jog and walk in the first week, jog in the following week when you feel ready to do so, start running easy 30 to 45 minutes each morning in the weeks that follow and in a few more weeks you are already beginning to notice great changes in your physical fitness and are well on your way to incorporating hill and speed workouts. What I like about running is that, as long as you have the right training shoes, apparel and a wrist watch, you can be able to begin running right away! It is only my hope that those seeking advice were inspired more by the wish to have healthy and fit bodies that can be able to run well over a 42km distance and other health rewards that comes with running rather than by a craving for quick monetary gains. 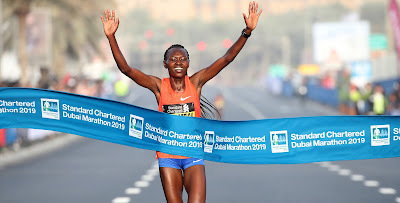 It takes a very long time to get close to where Kipchoge has reached, and if one is only driven by a desire to get quick money, it definitely is going to be hard for them to keep running for that long. It needs a lot of self-discipline to run competitively. Often, many runners easily end up undoing what they just gained in their training due to their lack of discipline. A runner can do a hard workout in the morning, but what he does for the remainder of the day will determine whether that workout will remain helpful to him or not. Recovering well, taking enough fluids, taking a nap and eating the right food will be some of the beneficial activities to do after training. Spending the better part of your day walking around and window shopping in town, partying, taking alcohol and forgetting to rehydrate are some of the negative activities for runners. Running also needs patience and consistency. It is good to set short a long term goals along one’s way to reaching their full potential. For example, one can set a goal to run under 45 minutes for a 10km in a year, try cutting that to 40 minutes the following season and keep aiming for a better performance each next time. Is the Nike’s Vaporfly 4% fair or unfair? Copyright 2018 Justin Lagat. Picture Window theme. Theme images by Jason Morrow. Powered by Blogger.